The main reason I wanted to go to Varanasi was to see famous Ganges River. Pilgrims from all over India come to visit the sacred Ganges. I actually got lost within the city somehow and it was hard to believe there was a major river nearby. Finally I came out of the alleys and stumbled on the massive river. 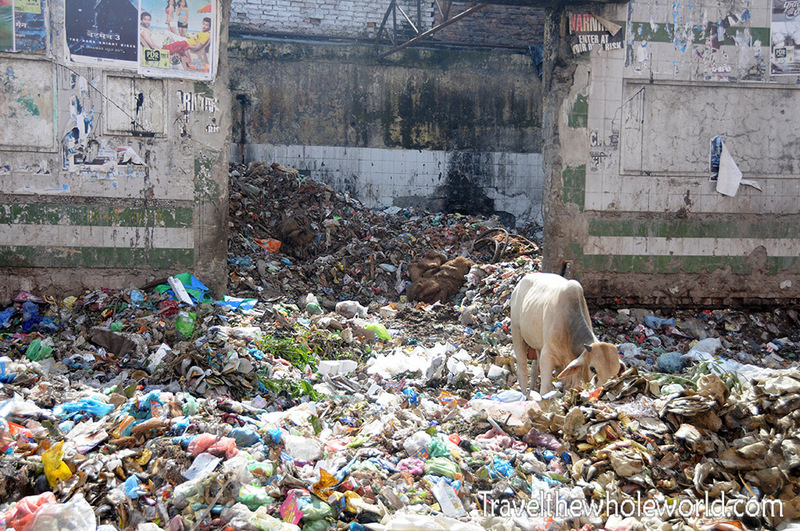 Of all my travels, I’d say visiting the Ganges was one of the most impressive cultural experiences I’ve ever had. 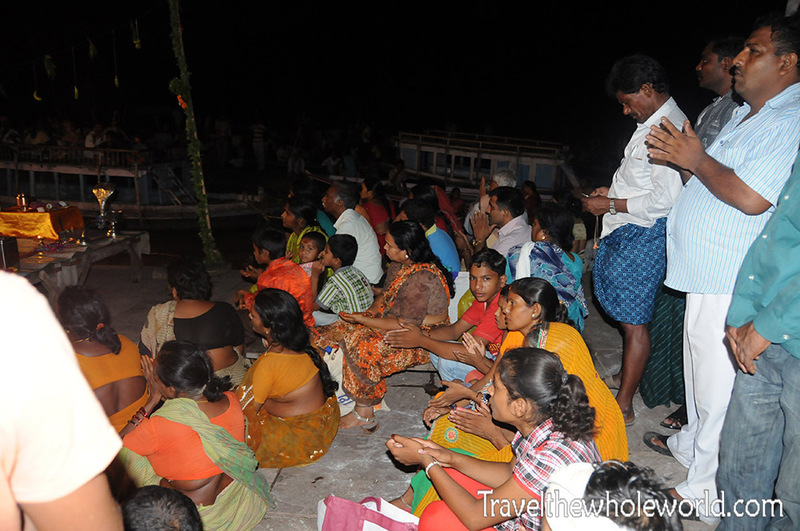 Above are some young Hindu kids praying along the shores of the river. People enter the Ganges rivers by use of Ghats, basically giant stone stairs that descend into the river. 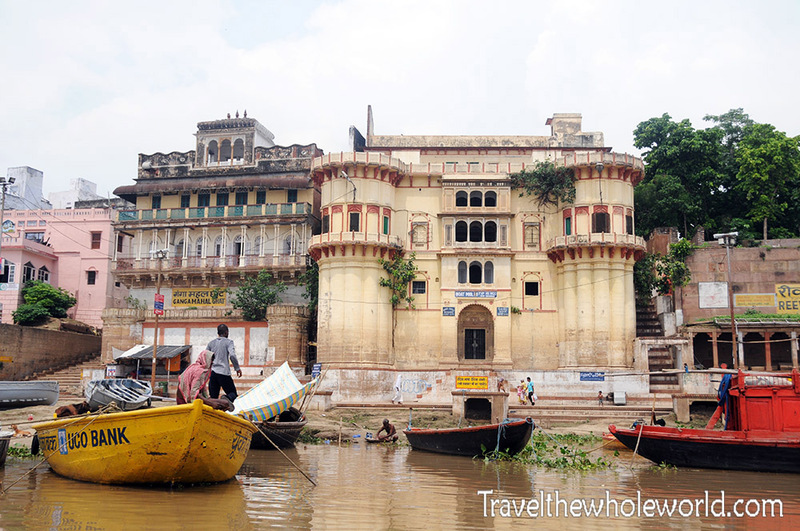 There are an incredible 108 ghats in Varanasi, and each one of them has their own name! Sometimes they are named after nearby religious sites or famous people. Above and below are two shots I took of the Ganges River. The reason why the Ganges is so sacred is because the river is used for just about everything you can possibly imagine, and I seriously mean everything. All in the same river you can find domesticated animals, people swimming, people taking bathes, cleaning their clothes, raw sewage pipes, and even floating corpses. 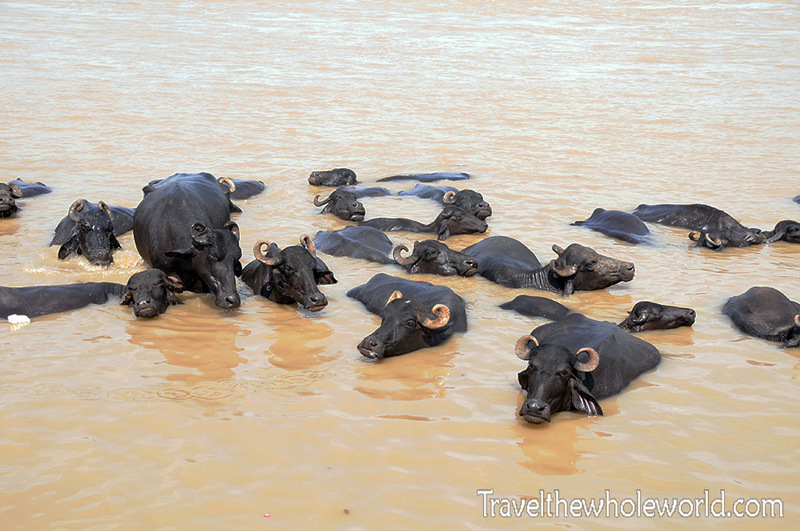 The area where the buffalo were was covered in their own feces along the steps with some in the water as well. I had to wonder if the guy above was doing himself any good by cleaning himself so close to the buffalo below.. I had given all my laundry to my hostel to clean that same morning and at the time it never occurred to me that my clothes were being washed in the river as well. While I was taking a boat ride a boy on the shores motioned for me to take his picture as he was preparing to dive in the water, then he made an x with his arms saying never mind. I wasn’t sure why until I looked over and saw the giant dead cow floating by. 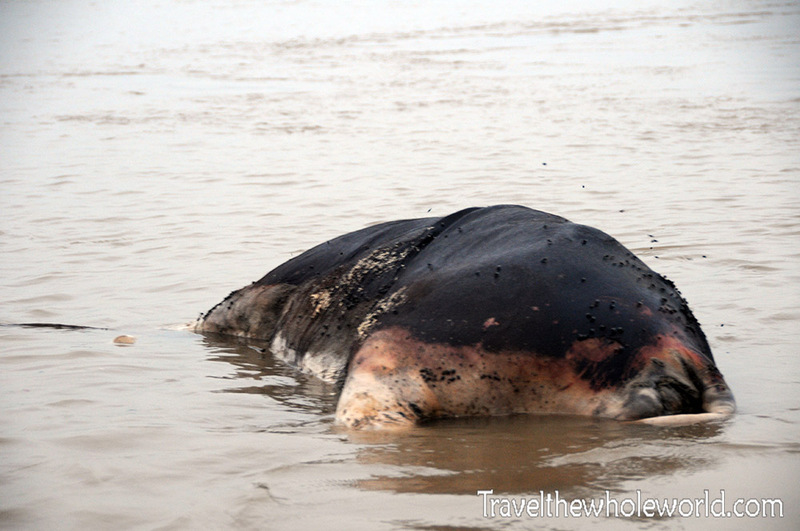 Something a bit morbid about Varanasi is that corpses of humans are very common along the river and its banks as well. There is no doubt in my mind if I had been determined to find one washed up along the shores of the Ganges. I had seen some grotesque documentary on this before that showed bodies half decomposed, and others actually being eaten by wild dogs. During a ride I did at night we were passed by an object that looked like a head and two arms sticking out of the water. This could have been absolutely anything since it was so dark, but it was followed by the powerful smell of rotten flesh, so it makes me wonder if I had seen a person floating by. Most bodies are burned along the shores of the river as photographed above. The man attending the fires didn’t give any special treatment to the deceased. 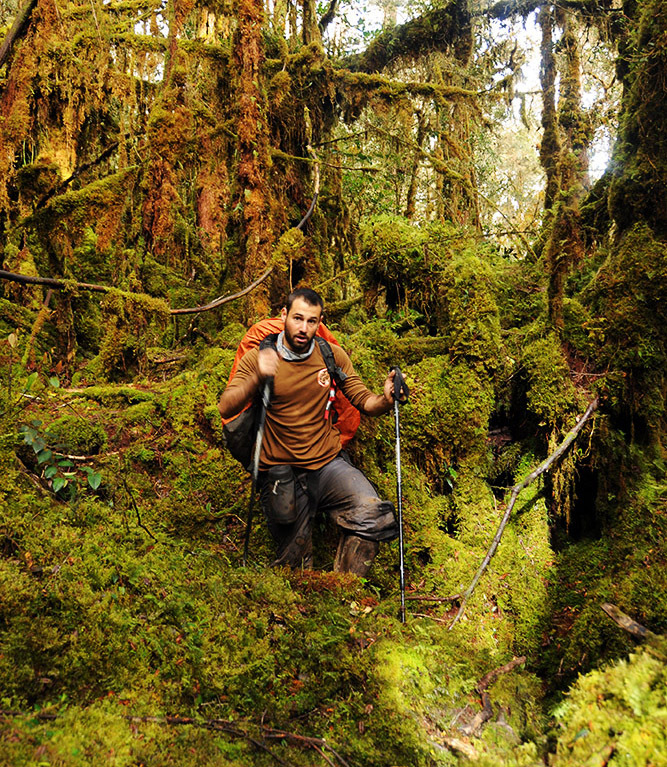 He rolled over one of the bodies in the fire and beat it with a stick to make it burn better as if it were a log. I was told the cremations burn for three hours and then their ashes are scattered about. With so much life and death on the same river and everyone so comfortable with it you can see how Varanasi is such a unique places in the world. 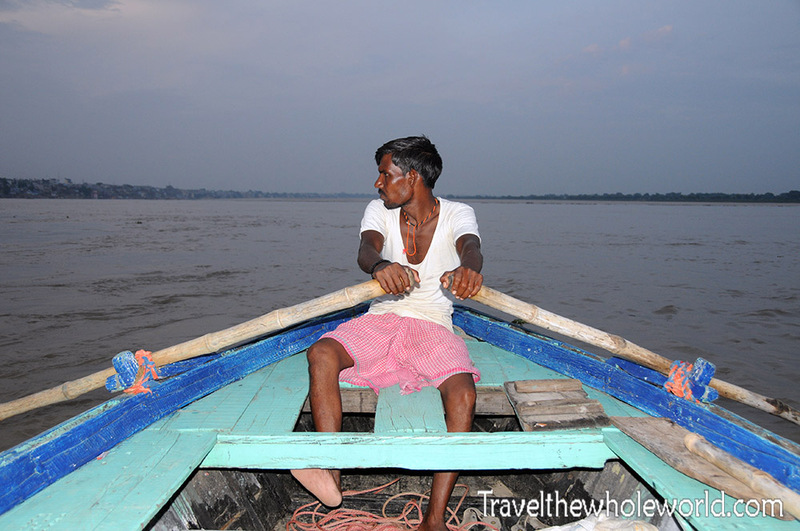 I loved seeing the Ganges river so much I took several boat rides during the day and at night. I found it was quite a different place during the night and day. In the morning or afternoon I saw lots of people bathing and young children gathered together for spiritual training and meditation. When evening came around, that’s when smoke began to rise up along the river as bodies were cremated. 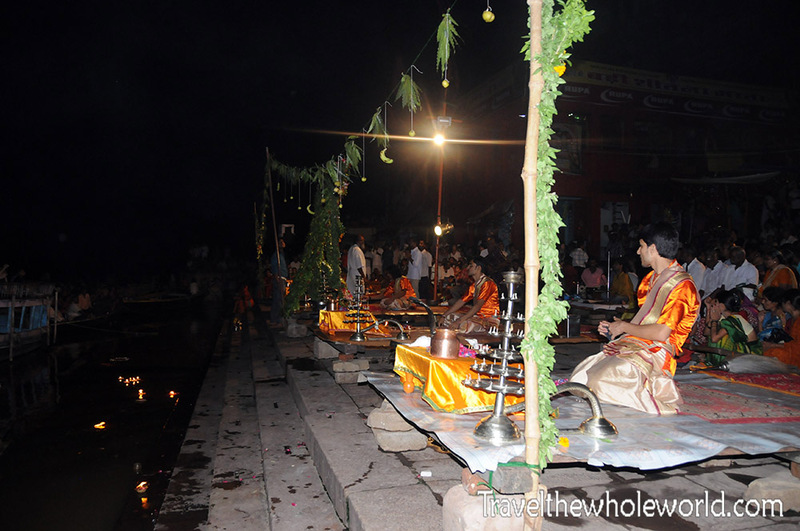 Every night in Varanasi there is a ceremony at 7:30 in the evening. I think I did a better job getting shots of all the people attending rather than the actual ceremony. I took a boat here and because it was so crowded we ended up tying up to other boats instead pulling up on the piers. What ended up happening was we all became an extension of the docks and had random people walking from boat to boat to get to shore. I did the same by climbing across several boats and finally up a large stone pier and making my way towards the actual ceremony. 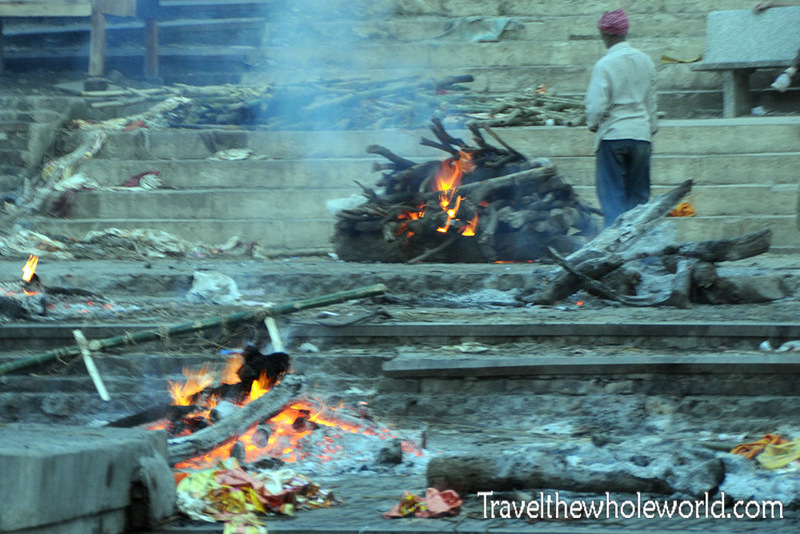 The nightly Hindu ceremony involves prayers and rituals such as waving open flames and incense along the Dashashwamedh Ghat. The performers of this ceremony also called the Aarti always face their deity or divine element. In Varanasi, this means they will always face the Ganges River. It was difficult to get any photographs of the ceremony since I was to the performer’s backs, and to be in front of them would put me in the water. The photo above was the best I could get. 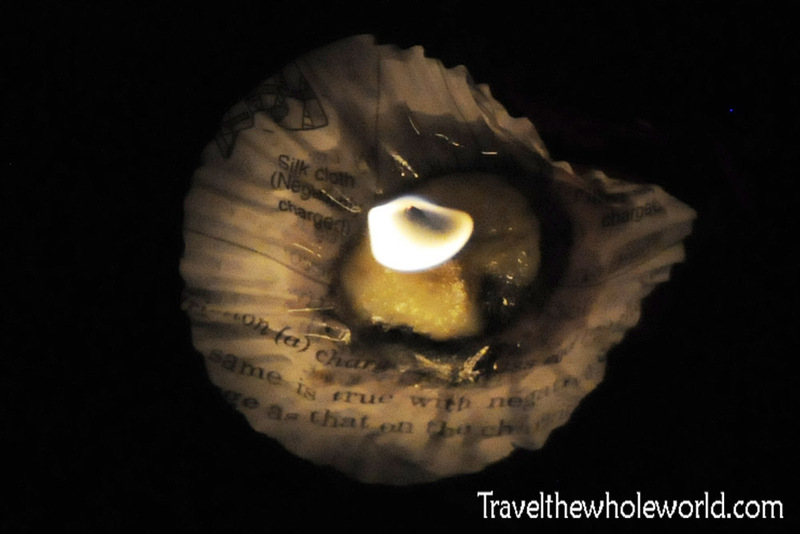 Below is a photograph of a candle floating down the Ganges River. After the ceremony my boat driver had a painful trip back to our Ghat. The river was very strong due to it being monsoon season and he rowed hard against it refusing to let me help even though there was an extra oar. People walking by were going much faster than us, after an hour we finally made it back. 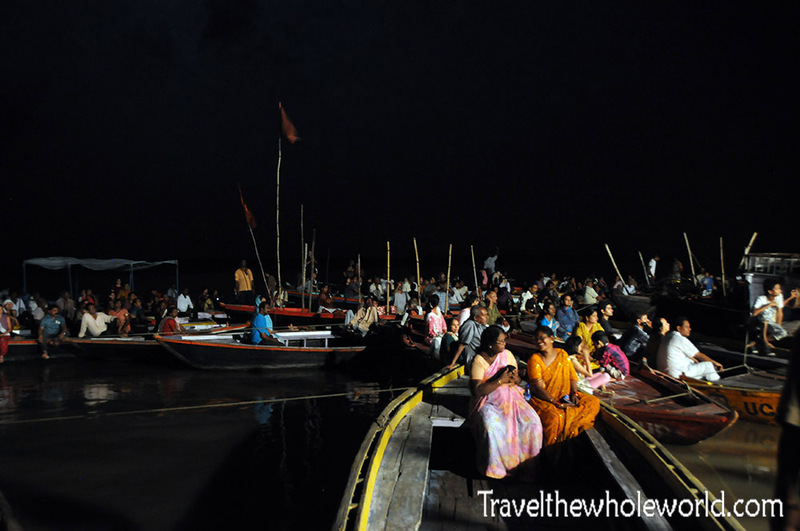 The culture and ceremonies along the Ganges river by far dominate Varanasi. But while I could post hundreds of photos from there there are still other important places in the city center. A local that I met outside my hostel took me via motorcycle to this giant temple. 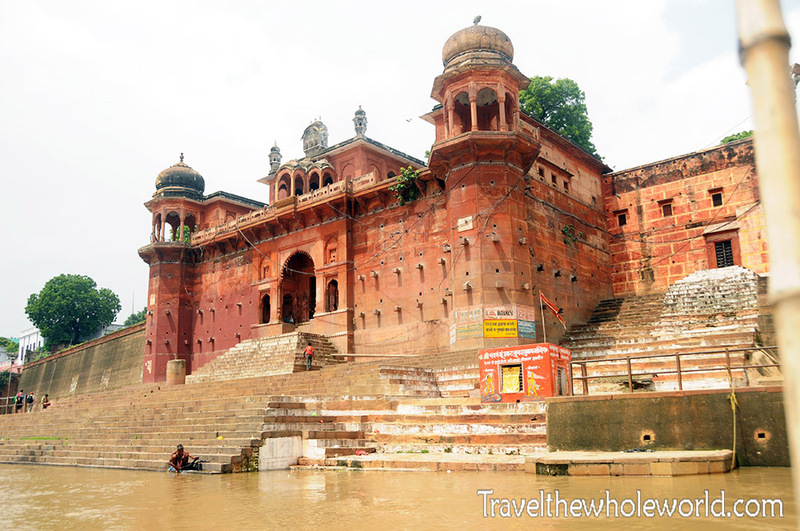 Kashi Vishwanath temple was the most impressive site I saw outside the river. We both went inside the temple where no photography was allowed. 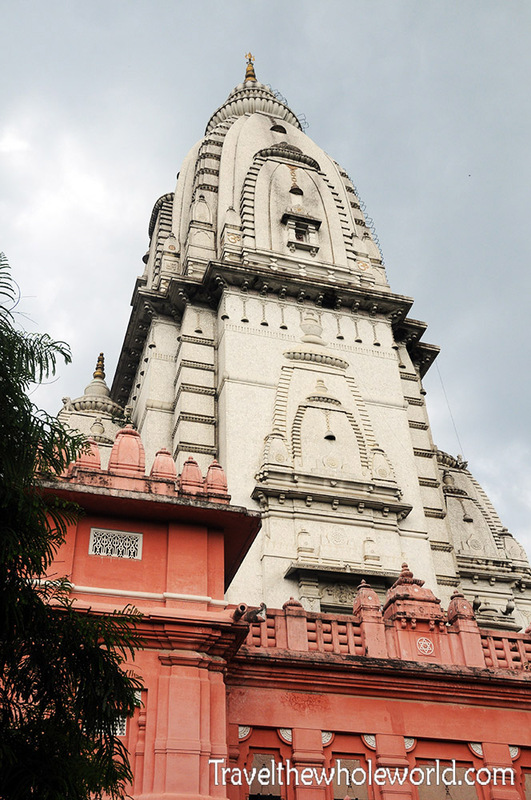 The temple had marble floors, and was decorated by several impressive Hindu statues. The temple had scores of people inside who had visited to pray. My new local friend explained to me that this is a place where locals come to make wishes. 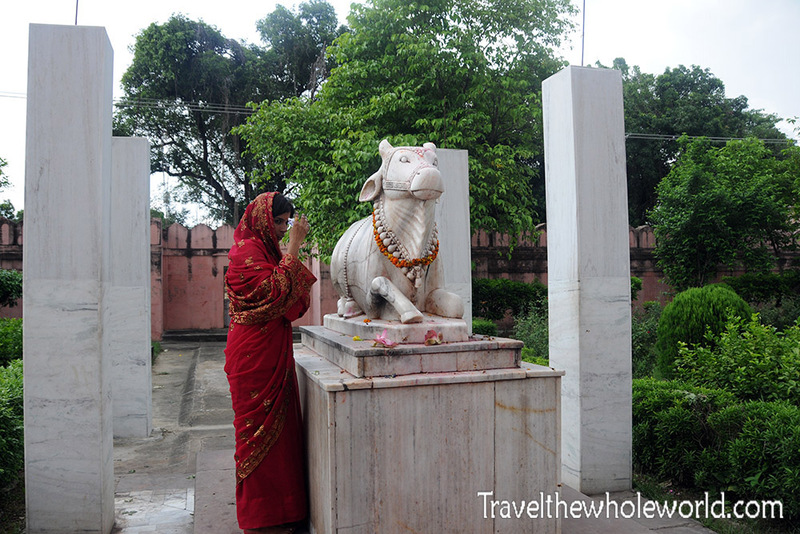 Often this is done by holding your hand on one of the statues and making a prayer as this woman is doing. I’m not much of a shopper but also visited a local silk shop. 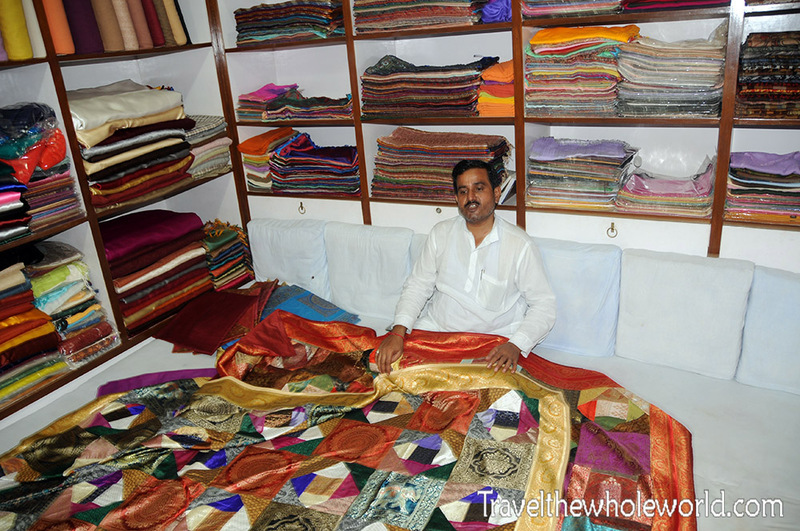 It was pretty large and they had a variety of things being made ranging from clothing, carpets and large sheets all by created hand. From what I could see, the workers were essentially using the same techniques from hundreds of years ago. 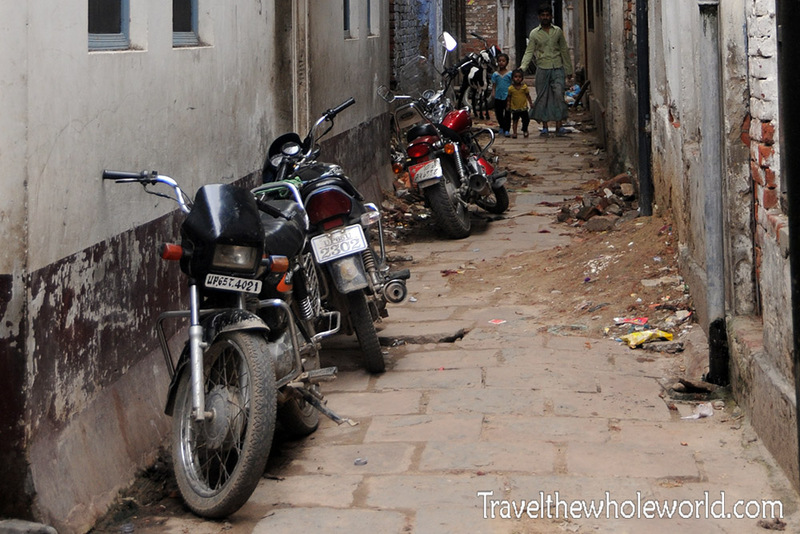 When I stayed in Varanasi it seemed power would go off several times a day, often for hours at a time. With no machinery the lack of electricity doesn’t effect these guys and their work. There were a few other places that I visited where I didn’t take any photos, such as the Monkey Temple and some other random places. I always enjoy walking around aimlessly in cities. The photo above shows a photograph I took in an alley I went through. I always hate to add anything negative but I found parts of the city unbearable due to the trash laid out on the streets. 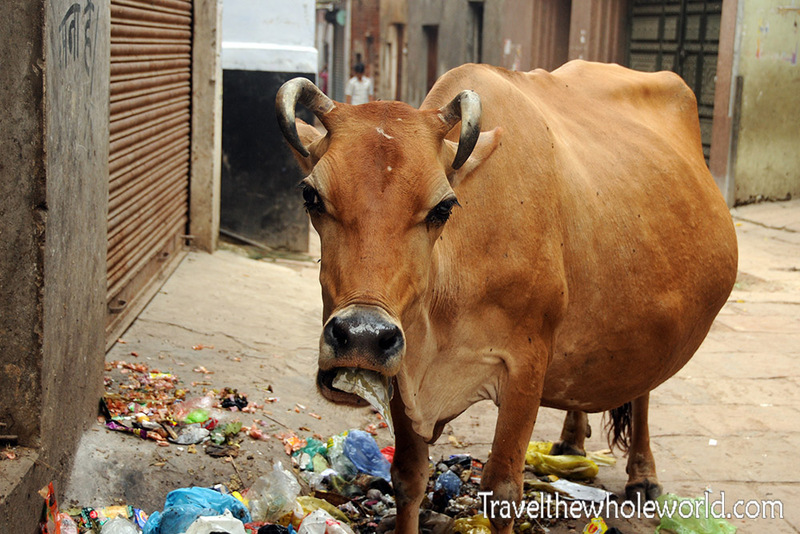 The cow didn’t seem to mind since trash meant a free meal, but some of the smells and bits of trash blowing around was a bit much for me. I had earlier seen a man and his son emptying out trash in the large pile which is right along side a major road. They weren’t emptying a few smile items but were unloading giant barrels of trash, most of it blowing away down the street! I’m sure in time this will surely change though, but some of the streets I walked down wasn’t a pleasant experience.